Redheughers mailing list is being revised to comply with GDPR. All members are being asked to provide their personal details - name, email address, and optionally home and mobile phone numbers and home address. We can not use old data to build a new list. Why are we doing this? From the end of May 2018 new regulations require that the data we hold is correct and is held with their consent. Any members who "drop off" our mailing list as a result of not providing their information by this deadline can use the contact page of this website to be added. A rainy day in Morpeth saw the band meet at St Georges church where once again we beat stiff competition to take first prize and the prestigious “Committee Cup”. Afterwards we celebrated with delicious coffee and cakes at the Chantry Pantry. A good day. The first Morpeth Gathering was held in 1968, and the Committee Cup for best country dance band was first awarded in 1969 to the “Eric Goodfellow Group”. The Redheughers first won this in 1987, and again in 1998. 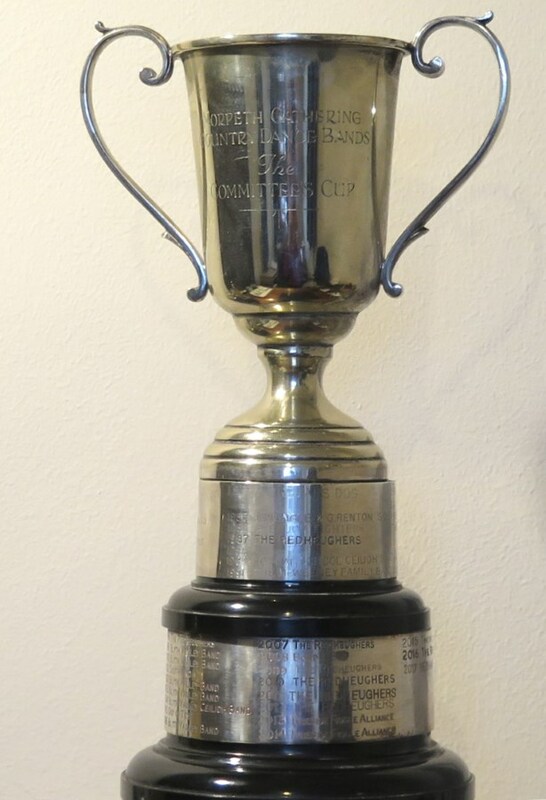 The Blyth Valley Band had great success winning the cup in 1999, 2000, 2002, 2003, 2004 and 2006; (six wins) while the Redheughers held the cup in 2007, 2009, 2010, 2011, 2012, 2016 and now 2018. In between the cup was won by the Tyneside Fiddle Alliance in 2013,14,15, and Hexham Village band in 2017. With 9 wins to their name the Redheughers have held this prestigious cup more than any other band. January 2 2018: First ceilidh of the new year. It was a very relaxed and gentle ceilidh as many regulars – and band members – were still on holiday. Richard called mostly easy dances, with a waltz to end the night. We met last night for our Christmas meal together at Marios. Their holiday special menu is great value, and we all enjoyed different meals. The sea bass on lentils was a favorite. Only £25 a head for a three course meal including a rather excessive amount of house wine. The Christmas ceilidh was a great success. Our band leader Robin called the dances, while Rachael led the music. There was a free raffle (typically I won nowt) and Richard won the prize for best hat. Looking forward to our next Ceilidh club ceilidh at St Mary’s on the second of January. The Redheughers Ceilidh band has a new website – its here, live in good time for our Christmas Ceilidh!